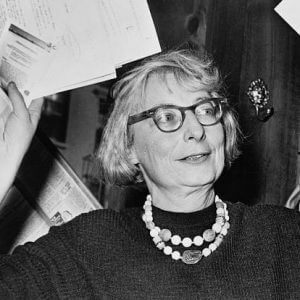 Jane Jacobs (1916-2006) was a journalist, author, and urban activist who championed new community-based approaches to urban planning and was an effective advocate of strong and viable communities. She argued for mixed-use urban neighborhoods of great diversity, density, dynamism, and activity. She championed small industries producing for local markets with local resources and local labor for local consumption—a vital means of decentralized economic development by means of “exuberant” import replacement. In 1958 the Rockefeller Foundation awarded a grant to Jacobs to produce a critical study of city planning and urban life: The Death and Life of Great American Cities (1961) became one of the most influential texts about the inner workings and failings of cities. Subsequent works include The Economy of Cities (1969), The Question of Separatism (1980), Cities and the Wealth of Nations (1984), Systems of Survival: A Dialogue on the Moral Foundations of Commerce and Politics (1993), The Nature of Economies (2000), and Dark Age Ahead (2004). Because of her criticism of experts in the male-dominated field of urban planning, Jacobs endured scorn from establishment figures. She did not have a college degree or any formal training in urban planning and was censured for lacking such credentials. Jacobs spearheaded local efforts to oppose the devastation of neighborhoods caused by building highways as advocated by New York City Parks Commissioner Robert Moses. In 1962 she became chair of the Joint Committee to Stop the Lower Manhattan Expressway, which opposed Moses’s plans to put a highway through Washington Square and the West Village. Thanks to her persistence, the Expressway was stopped. The campaign is often considered to be one of the turning points in the development of New York City. To keep her son from being drafted, in 1968 Jacobs moved with her family to Toronto, where she spent the rest of her life. She joined the Stop Spadina Campaign to prevent completion of a highway through some of Toronto’s liveliest neighborhoods; Premier William Davis cancelled the Expressway in 1971, signaling the end to plans for other expressways that would cut through neighborhoods. Jane Jacobs was a leading proponent of economic growth and prosperity at the local level as essential for the survival and flourishing of our cities. She believed that engaged citizens who know and love their own communities could work together to revive our regional economies, our democracy, and our society.